The Reverend Thomas Bayes, whose work in probability underlies Bayesian statistics, enrolled in the University of Edinburgh in 1719. The university is now home to the Bayes Centre and Thomas Bayes Chair of Statistics, held by Professor Ruth King. Edinburgh is a beautiful and historical location intimately associated with Thomas Bayes, who studied logic and theology at the University of Edinburgh as an undergraduate (circa 1719–1722). What do in Edinburgh when you’re not at the conference? Scotland’s capital city, Edinburgh, offers a wealth of options for tourism including Scotland’s capital city, Edinburgh, offers a huge variety of tourist attractions including museums, art galleries, restaurants and bars, and is easily accessible from the conference centre by a 20–30 minute bus journey. Edinburgh’s cultural attractions include the spectacular fortress of Edinburgh Castle, Scotland’s five national museums of art, a world-class zoo, a buzzing theatre scene, the largest arts festival in the world and some of the UK’s best fine-dining restaurants. The Old and New Towns of Edinburgh are listed UNESCO World Heritage Sites and feature some of the finest examples of medieval and Georgian architecture. Despite the huge range of attractions on offer, Edinburgh is compact and easily explored on foot. Edinburgh also has excellent transport links and is ideally located as an embarkation point for trips further afield to explore Scotland’s rich history, national parks, beaches and wildlife. A wealth of tourist information can be obtained from the Visit Scotland website: http://www.visitscotland.com. Many exciting city sightseeing bus tours are available, and 10% discounts for delegates are available if you buy from here. 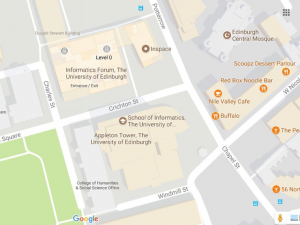 The conference will be held at Appleton Tower in Edinburgh and is located between Potterrow, Crichton Street and Windmill Street in the University of Edinburgh Central Area Campus. This is in the city centre and is close to all local attractions and a number of hotels. Edinburgh has a compact city centre and Appleton Tower is within reasonable walking distance of the main rail and bus stations, and it is approximately a 30 minute journey from the airport. The dinner and céilidh will be held at the National Museum of Scotland in Edinburgh. The Science Céilidh is an award-winning educational project adapting Scottish dances to explain science concepts by working with researchers, community groups and schools through events, workshops and resources. From the Dashing White Blood Cell to Fluorescent Flings and Orcadian Strip the Helixes, the Science Céilidh Band (comprised of both scientists and musicians) have had over 14,000 people in folk and science festivals across the UK and beyond up and ceilidh-ing with their high-energy performances creatively exploring neuroscience, chemistry and space. Science Céilidh’s are welcome to everyone, regardless of science (or dancing!) experience, so come along and give it a whirl! Edinburgh boasts an international airport located about 8 miles from the city centre. If you need to travel around the UK by train then http://thetrainline.com can be used to search times and purchase tickets. The Airlink 100 express bus service which operates a 24-hour shuttle service between Edinburgh Airport and Waverley Bridge (near Princes Street and the main Waverley train station and bus stations), with designated stops en route. The service is frequent—every 10 minutes at peak times—with a journey time of about 25 minutes. Use the Lothian Bus and Tram journey planner (enter Appleton Tower as destination to get to the conference venue). Tickets can be purchased at the bus stop before boarding or using a phone app. A 10% discounts for delegates are available if you buy from here. For driving from Edinburgh Airport, vehicles can be hired from all major companies at the airport’s car rental facility close to the main terminal building. 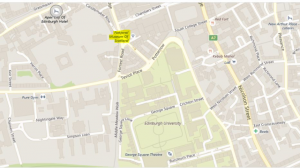 For satellite navigation systems, the address to use for the conference venue is 11 Crichton Street, Edinburgh EH8 9LE. Note that parking around the Appleton Tower can be very challenging. Trams are not good for getting to the Appleton Tower but great for getting to town if your accomodation is nearby. Edinburgh trams are the latest addition to Edinburgh’s existing range of first-class public transport. The high-quality and efficient tram network now runs between Edinburgh Airport and the city centre with 15 stops along the route, including Princes Street and Haymarket Station. Single or return tickets can be purchased for journeys to or from Edinburgh airport. Tickets can be purchased from vending machines at every tram stop. You can pay using your debit or credit card as well as coins, but please note that no change is given. Tickets can also be purchased using a phone app. Use the Lothian Bus and Tram journey planner (enter Appleton Tower as destination to get to the conference venue). Please note that tickets can be purchased when boarding the bus (no change is given) or via an phone app. To make a reservation, please click on www.lh.com/event-flight-booking and enter the access code GBZJEFO in the “Offer for discounted flights” area. This will open an online booking platform that will automatically calculate the discount offered or provide you with an even better offer if another promotional fare is available. lufthansa.mobility@dlh.de and providing the access code as a reference. Hotel rooms may be reserved through Convention Edinburgh. Submission of travel support applications starts March 15 2018 and ends April 15 2018. Awardees will be notified as soon as possible afterwards. Eligibility criteria : support is for junior researchers (students currently enrolled in an MSc/PhD program or have graduated no more than 3 years ago) who are already registered and whose poster/oral presentation has been approved. Applications should include as a single PDF (named LASTNAME_FIRSTNAME_ISBAtravel.pdf) file (1) a one-page letter with basic CV info (place/date of academic qualifications) and summarize the research the applicant will present and (2) proof of current enrollment (letter from school or MSc/PhD certificate featuring the graduation date). Applications should be emailed as an attachment to isba_program2018@griffith.edu.au with the subject header Travel Support Application.